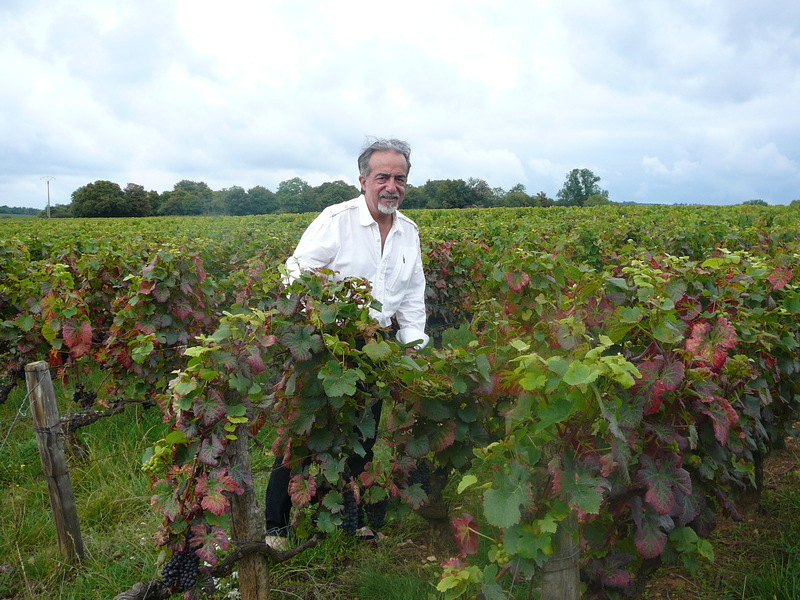 Me standing in a vineyard just behind my father’s home in Givry! For long wines from the Cote Chalonnaise have been ignored because they were “wampirized” by the big Bourgogne “negociants/dealers” who found very practical to mix them with other wines and sell them as better-quality straight Bourgogne appellation bottles. But times have changed and especially the new generation of wine growers have rebelled and gone their own way, proving that quality for quality their wines were better value than their “cousins” up north. The term “cousins” is what the the so-called specialists often call Cote Chalonnaise wines when comparing them to the celebrated nectars which have made Bourgogne known all the World. I certainly beg to differ. Cote Chalonnaise wines have simply matured into a variety of their own. 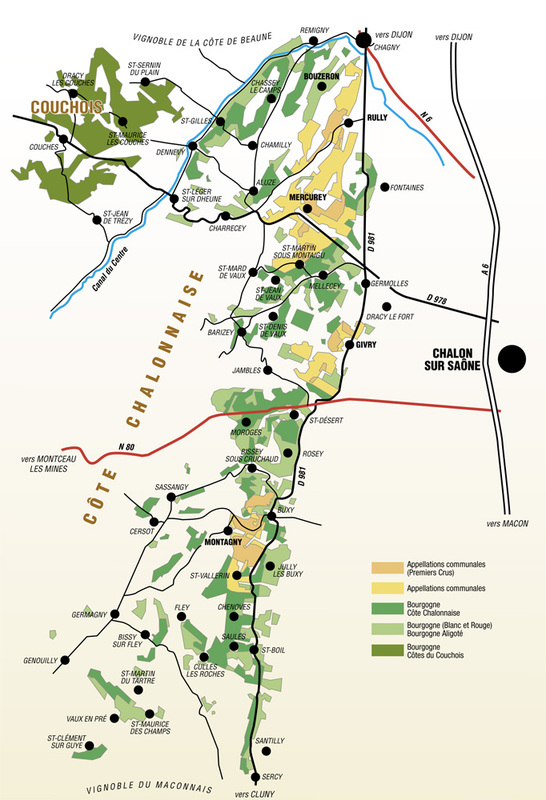 Côte Chalonnaise is a subregion of the Burgundy/Bourgogne wine region of France. Côte Chalonnaise lies to the south of the Côte d’Or continuing the same geology southward. It is still in the main area of Burgundy wine production but it includes no Grand cru vineyards. Like the Côte d’Or, it is at the western edge of the broad valley of the river Saône, on the rising ground overlooking the town of Chalon-sur-Saône which is about six kilometers out into the plain. To the north, across the River Dheune, lies the Côte de Beaune. To the south is the Mâconnais. The grapes of the region are predominantly Pinot Noir and Chardonnay with some Aligoté and Gamay also grown in vineyards spread over a stretch of 25 kilometers long and 7 kilometers wide of undulating land in which vineyards are interspersed with orchards and other forms of farming. The wine-producing communes of the Côte Chalonnaise are, from the north: Bouzeron, the only communal AOC for Aligoté still wine; Rully, which has 23 premier cru vineyards and is known for its white wines as well as being a center for Crémant sparkling wines production; Mercurey, which with 30 premier cru vineyards is the largest volume producer of the region, its wines being nearly all red; Givry, with 17 premier cru vineyards producing mostly red wines; and Montagny, which produces only white wines in its 49 premier cru vineyards. La Maison Des Vins in Chalon sur Saone has done invaluable work since 1982 to make the wines of the region better known to the general public and connoisseurs alike. It offers their own selection twice a year, choosing the best 122 wines of Cote Chalonnaise in one single Wine shop with the help of a blind tasting jury. The chosen wines will be sold there at the producers’ prices (lower than anywhere else!) for the following 6 months! The Restaurant de La Maison des Vins on the second floor (equiped with elevator and physically-impaired people facilities) will introduce you to the regional gastronomy served with the wines of the Cote Chalonnaise in a very quiet part of the city near the very wide Saone River. Both are a must-visit before you venture through the hilly country in search for your unknown nectar! The Côte Chalonnaise is named after the town of Chalon-sur-Saône, located on the Saône. Its location made the town an important trading center of the Celts in Gaul and was known as Cabilonum. The region was later used by the Ancient Romans with wine being one of the commodities traded up and down the river. 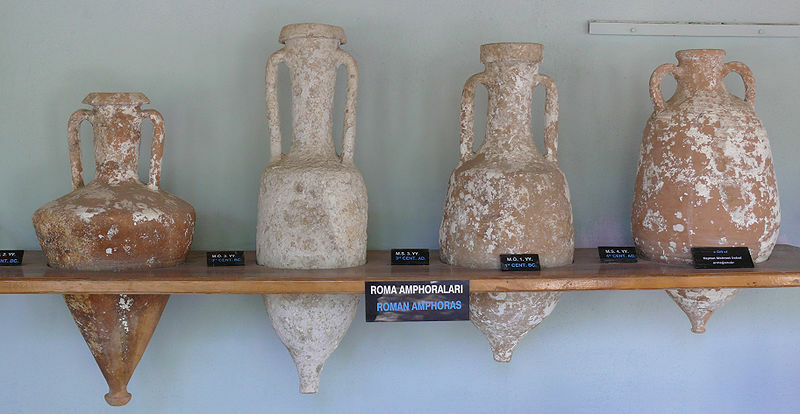 More than 20,000 amphorae stamped with Roman emblems have been found in graves in this area, and 1,000 were discovered at the bottom of the Saone River apparently thrown overboard by a Roman trader who discovered the practicality of Celtic oak casks! South of the village of Santenay in the Côte de Beaune region is the city of Chagny which begins the Côte Chalonnaise, although the city itself does not produce wine. On the other hand Maranges, although lying in Saone et Loire is not part of Cote Chalonnaise yet. The climate and vineyard soils of the Côte Chalonnaise are very similar to those of the Côte d’Or, though the rainfall is slightly less. However, unlike the Côte d’Or, the vineyards of the Côte Chalonnaise do not run along the slopes of a single escarpment but rather are three isolated on patches of limestone. The first patch of vineyards located northwest of Chalon-sur-Saône includes the villages of Bouzeron, Rully and Mercurey which is separated by only a few kilometers from the second patch of vineyards around the village of Givry. Located due west from Saint-Rémy and southwest of Chalon-sur-Saône this patch is nearly 5 kilometers from the third patch of vineyards that make up the Montagny region. The landscape of the region is much more agrarian than other parts of Burgundy with pastures and orchards interspersed among vineyards. The soft rolling hills of the area reach altitudes between 750-1,050 feet (230-320 meters). These hills provide some protection from frost and hail damage. The soil is predominately limestone mixed with sand and clay and the occasional iron deposit. Around the city of Mercurey, the soil has a high concentration of iron-enriched marl. The diversity in slopes and soils creates a myriad of microclimates that can greatly influence the varying quality of wine from the Côte Chalonnaise, even among vineyards labeled as premier cru. 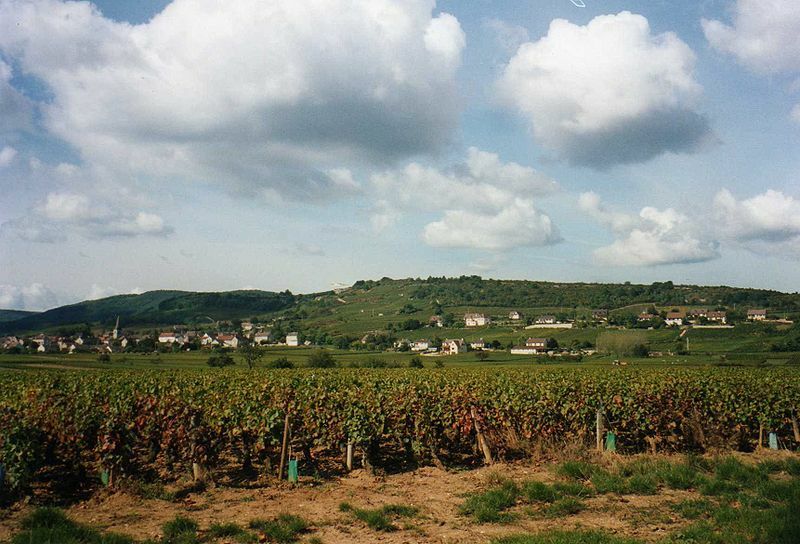 All wine produced in the Côte Chalonnaise qualifies for the Appellation d’origine contrôlée (AOC) Bourgogne Côte Chalonnaise though it is more often declassified to the generic Bourgogne AOC because of the higher name recognition of the later. Sparkling wine made from the region is usually labeled as Crémant de Bourgogne. The Côte Chalonnaise has five village-level AOCs. They are, from north to south: Bouzeron, the only communal AOC for Aligoté still wine; Rully, which has 23 premier cru vineyards and is known for its white wines as well as being a center for Crémant sparkling wines production; Mercurey, which with 30 premier cru vineyards is the largest volume producer of the region, its production being nearly all red; Givry, whose 17 premier cru vineyards also produce mostly red wines; and Montagny which produces only white wines and has 49 premier cru vineyards. 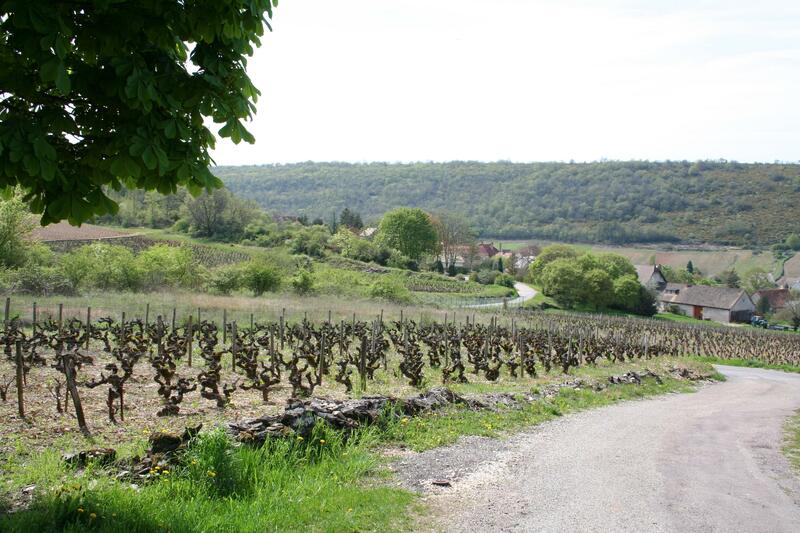 There is currently no Grand Cru classed vineyards in the Côte Chalonnaise. Visiting La Maison Des Vins in Chalon sur Saone with the Missus, my brother, Francois and the Master of the House, Jean-Charles Bezin. Click for bigger image and printing! Bouzeron became the 5th Cote Chalonnaise Village/Commune in Saône-et-Loire departement. It is located nearest to Côte-d’Or. Created by a government decree on February 17th, 1998, this appellation has replaced the old regional appellation, Bourgogne Aligoté Bouzeron, introduce in 1979. Production villages/communes : Bouzeron et Chassey-le-Camp. In the Côte Chalonnaise, in northern Saône-et-Loire, it is separated from Santenay by the Dheune River valley. This slopy village lies very near Rully and Chassagne-Montrachet. Domaine A & P de Villaine, Bouzeron. 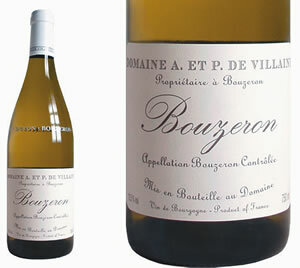 Bouzeron and its Aligoté was spearheaded by the efforts of Aubert de Villaine, co-owner of Domaine de la Romanee-Conti. 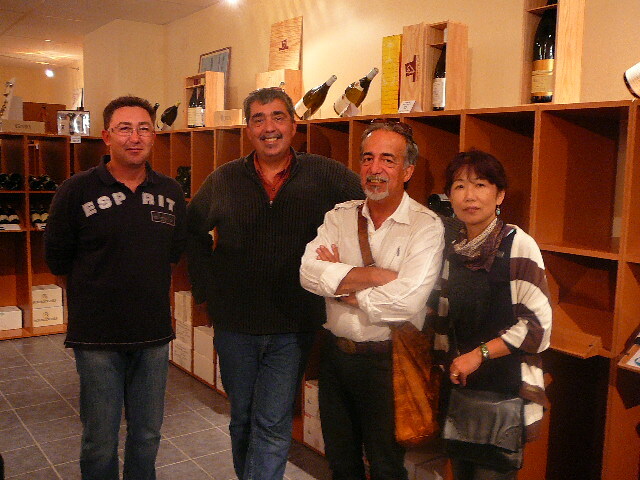 Together with his wife Pamela de Villaine he owns Domaine A & P de Villaine in Bouzeron. Mr Chanzy Daniel, grower/producer, one of the creators of the apppellation is the present president of the appellation Committee. Syndicat viticole de l’appellation Bouzeron, 71150 BOUZERON. The village, first called “Boserontis villa”, was given by King Charles le Chauve (The Bald) in 872 to the monks of Saint-Marcel-les-Chalon. 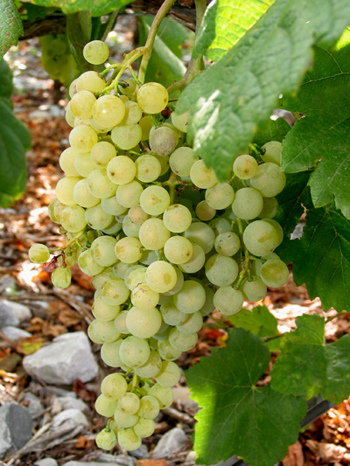 Bouzeron are exclusively made (100%) with Aligote grapes. Bouzeron is the sole Aligote village appelletion in the world! This white wine has a light golden hue with a pale green note which can becaome a light straw colour. Its aroma reminds of acacia, white fowers and hazlenuts. It is complemented with mineral scents (limestone) and lemon, its classical bouquet. An occasional memory of honey and hot croissant pleasantly peeks out. Well-rounded on the palate, it reveals a solid body and a typical aligote grape lively character. Nuances vary with the terroirs. White: superb lively and rounded synthesis. This “gourmand” and delicately powerful wine offers its lemon notes to oysters with a beneficial channeling of the latter’s iodine strength thanks to a sustained minerality. It equally benefits tarama and crustaceans, steamed or in gratins. Its pronouced roundness emphazies veal and poultry in hite sauces. Mushrooms risotto will thank it thanks to its aromatic consistency. Served as a first wine with beautiful gougères and appetizers: jambon persillé, mixed salads, quiches… it perfectly marrries with most chèvres/goat, beaufort, comté et cîteaux cheeses. Service temperature: 10 to 11 °C as an aperitif, 11 to 12 °C on the table (meal).